Serious child minding the crepe. It’s a glorious, wonderful, spectacular day when your child becomes tall enough to reach the stove unassisted! It also means she can turn on the kitchen faucet and load the dishwasher. Illness has visited our house this week, so Saturday night it was just the girl and me eating solid foods. And, as is typical, I revert to my vegetarian ways when I don’t need to feed my husband, so…the girl and I made crepes. Crepes are wonderful. They can be savory, they can be sweet, they can be in-between. And they hide all manner of leftovers, should you have them. Leftovers, or food failures, as was the case with the feta I made this week, which came out decidedly unset and lumpy (oh it tasted fantastic, the texture was off), so melted with a little butter and milk, it became the topping for the crepes. Crepes are the best ever! It’s how I trick my husband into eating eggs… he has no idea the recipe calls for 6 eggs… whooo hooo… it’s like a double bonus at dinner time! Are you saying you use raw turnips in a salad? 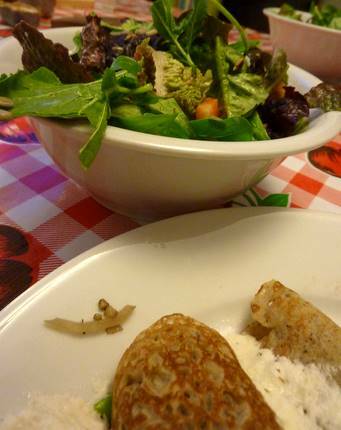 if so do you slice them real thin.Never thought of a turnip as a salad ingredient before.As for Crepes I usually buy a bag of Buckwheat flour in Penn Yan NY each fall on my visit.A lot of the Mennonite farmers grow it there and I love Buckwheat Crepes. 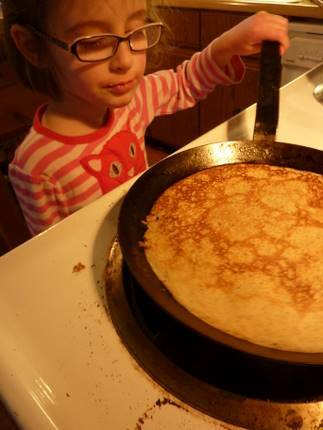 El, the photo of your serious daughter tending the crepe is totally charming. I’ve been going through back posts of FGtW and eating it up, in spite of deep and unseemly greenhouse-envy. You’re doing just a wonderful job of showing how to eat locally and joyfully through the northern winter, and your writing is full of grace and wit. Crepes are a favorite of ours, too, though we don’t make them often enough. Our most favorite is probably buckwheat crepes filled with melted leeks, cream, and gruyere. Wrapping things up in crepes or pastry is a great way to make root veg more interesting come February–for us last night it was pasties filled with leftover lamb, squash, carrots, leeks, turnips and potatoes all from our garden, some onions and garlic cellared from the farmers’ market. I scored some crepes recently, courtesy of our latest guest cook. She made vanilla bean-infused crepes for a dessert and we got to take some home after taping the show. I filled them with the last of the raw milk cheddar from our summer CSA, then served them with apples sauteed in butter and a bit of maple syrup (both from the CSA as well) and some breakfast saugages from our meat CSA. Scrumptious. What a great picture, she look so intent. Sorry to hear that your household has been hit by the sick bugs. Crepes really are so versatile, and can stand in at any meal – they just make the most simple of ingredients (or, as you say, leftovers) bring out new light. It’d be interesting to see how the applesauce/apple chunks might work as a filling… humm…. now you’ve got me thinking. I’ve made rice crepes and crepes out of chickpea flour lately, and they are a real treat. Mavis, how funny!!! What I love is they’re so light on the flour thing, so if you did want to eat local, these might fit the bill nicely. John, indeed. Small turnips are quite delicious raw: they don’t have the fire or bilious stench that big ones do…plus, just like everything else, the winter does tame them, converting some starches to sugars. Buckwheat flour! Yay, it’s quite a bonus; glad you stock up. It adds such a sweet/nutty flavor to them. MC, how fun: garbanzo pancakes! I made some recently as a trial for someone who’s all of a sudden dairy/wheat intolerant: they were rather tasty. And rice crepes! I haven’t used my grain grinder for rice yet but now you have ME thinking. I love warm rice cereal.